Turquoise tools and a print used by the Royal Horticultural Society create vibrant sets for noble pruners. You could journey to Queen Elizabeth II's garden to relish in a bit of noble landscaping. 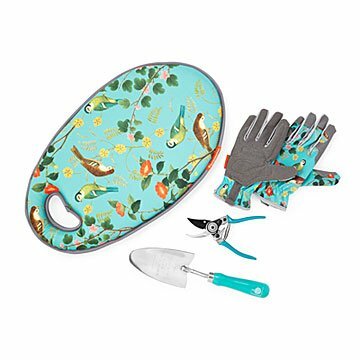 Or you could prune and plant with one (or more) of these stately sets featuring turquoise-accented tools and a bright 19th century print from the Royal Horticultural Society archives. Functional yet elegant, the accessory options include: a trowel and pruner, kneeler, or gloves. The print is created using chinoiserie-style watercolor, a delicate Chinese painting technique. Sweet, fluttering songbirds echo the beauty of our natural world. It's a gift fit for a queen, or just the garden fanatic in your life. Made in China. Kneeler, Trowel & Pruner: wipe clean with damp cloth.